Introduced in 2007, the perpetual calendar with retrograde date in an enlarged officer’s style case is a true tribute to officer’s watches–their backs are protected by dust covers – are a long-standing Patek Philippe tradition. The diameter of the case, which features a gold dust cover that protects the sapphire-crystal back, is 38 mm – 2 mm more than its predecessor. The dial has been thoroughly reworked to reflect the statelier prominence of this wristwatch. The Roman numerals in the hour circle were slightly extended. Their larger, elongated look enhances readability. The dial features a hand-guilloched sunburst pattern in the center, a radiant contrast to the silvery opaline background. The day, month and leap-year displays in apertures, as well as the retrograde date indication with a flyback hand, are elegantly arranged, emphasizing the understated nobility of this perpetual-calendar timepiece. The moon-phase display in the aperture at 6 o’clock is also eloquently integrated in the layout. The hour and minute hands, which are black oxidized gold, as well as the slender seconds hand, appear to hover above the dial. The Ref. 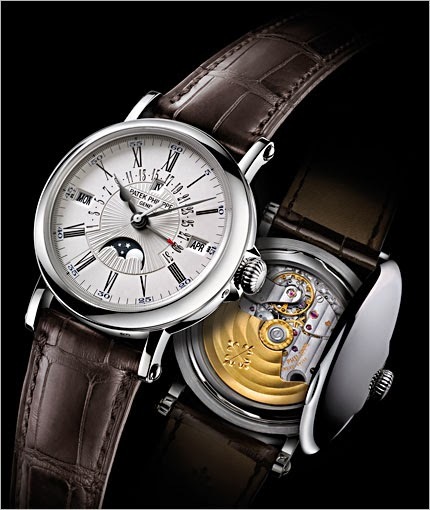 5159, incidentally, is one of the few perpetual-calendar watches with a center sweep second. The case of the Ref. 5159 is just as sophisticated as the timepiece itself. A solid gold dust cover, an authentic hallmark of Patek Philippe officer’s watches, protects the display back. Although this may seem simply aesthetic, when the cover snaps shut, it must be tight around the entire circumference. The casemaker checks this precision fit with a magnifying glass and at the same time listens attentively to the click and will patiently adjust the hinge until the perfectly sealed cover makes the sound that is associated with a Patek Philippe officer’s watch. The sapphire-crystal case back reveals the well-known self-winding caliber 315 S QR movement, which automatically recognizes the duration of each month and keeps track of leap years. S stands for sweep seconds, Q for perpetual calendar, and R for the retrograde date with the flyback hand. The retrograde date is a remarkable complication because the date hand moves along a 270-degree arc, and at about midnight of the last day of the month, it jumps back to the numeral 1. During the precisely controlled flyback phase, the hand is disconnected from the drive train and instantly captured at the 1 so that it cannot inadvertently rebound forward by one or two days. The complexity of the moon-phase mechanism is equally astonishing: it remains accurate for 122 years and 45 days, and then only has to be corrected by one day. To execute these complicated functions, 361 individual parts must interact in perfect harmony. The best artisans and watchmakers fine-tune each of these parts until they satisfy Patek Philippe’s rigorous quality standards. The teeth of the steel wheels, for example, are polished by hand one by one because this surface quality generates less friction and reduces wear. Of course, the movement complies with all criteria of the Geneva Seal, the most stringent set of specifications for the ultimate in horological craftsmanship. The sheer beauty of this movement, the perfect finish, and the smooth motion of the heavy 21K gold rotor can be admired through the sapphire-crystal case back when the dust cover of the case is opened. The watch is available in 18K yellow or white gold. It is worn on an alligator strap with an 18K foldover clasp. The yellow-gold watch has a matte chocolate strap and the white-gold model comes with a matte dark brown strap.